Well, almost. Brazilian doctors are using the skin of tilapia fish to help burn victims recover from their injuries. And the first trials on some 50 patients were completed this month. They used the skin from Tilapia fish, a disease-resistant species found in Brazilian rivers. Before the fish strips are used, researchers put the skin through a rigorous process that removes scales, muscle tissue, toxins and any possibility of transmitted diseases. It also gets rid of the fishy smell. It is stretched and laminated then stored in refrigerated banks based in Sao Paulo, in strips of 10cm by 20cm for up to two years. The result is something similar to human skin and remains flexible and easy to mould around a wound. 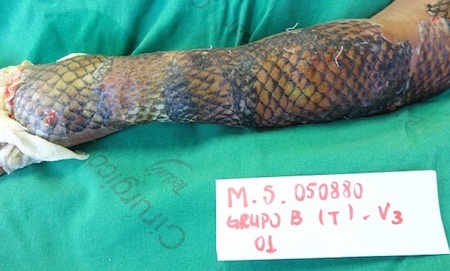 The Tilapia's skin was left on Miss da Silva's neck, face and left arm for 11 days before being removed. Doctors kept the fish skin on her left hand for longer as these wounds were deeper. The fish skin grafts on her hand were replaced many times over a 20 day period to restore the damaged tissue. The sandtrout glove. It was the play of children. If one held a sandtrout in the hand, smoothing it over your skin, it formed a living glove. Traces of blood in the skin's capillaries could be sensed by the creatures, but something mingled with the blood’s water repelled them. Sooner or later, the glove would slip off into the sand, there to be lifted into a spice fiber basket. The spice soothed them until they were dumped into the death still. The sandtrout squirm down his hand, elongating, stretching. He felt the sandtrout becoming thin, covering more and more of his hand. No sandtrout had ever before encountered a hand such as this one, every cell supersaturated with space. No other human has ever lived before and reasoned in such a condition. Ledo felt the sandtrout grow in, spreading itself over more and more of his hand, reaching up his arm. He located another, placed it over the first one. Contact ignited a frenzied squirming in the creatures. Their cilia locked and they became a single membrane which enclosed him to the elbow. The sandtrout adjusted to the living glove of childhood play, but thinner and more sensitive as he lured it into the role of a skin symbiont.